For a second there I thought we were skipping "F" because he was a little too risquee (yes that is how you spell it, I looked it up). 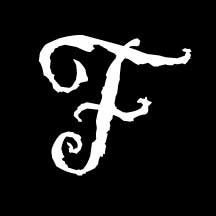 Anyways, glad to see "F" is pretty close to what I imagined - the bad boy every girl wants to date. In my alternate reality, he looks like Colin Farrell. Well I think Schappy missed out on this one as he could have chosen a much more utilitarian and colorful word for F, but instead he wussed out on Friday. And Tan speaking of other F-Words hate to burst your bubble but Collin Farrell is gay...so if your alternate reality "F" wears a cashmere sweater and a Prada Man-purse then it fits the bill. All you women deny it, but I can see it and I am never wrong. And before you beat me to it - another good F-word is Five. As in I owe you Five bucks. Yes - you do owe me 5 bucks. Never underestimate the power of the internet.